Reserved Tom and outspoken Melly are used to change. Their father, Sergeant Major Jim McCarron, served in World War II. Together with their mother Lina, a skittish Italian war bride, they frequently move from one uncomfortable army base to the next. No one except Melly dares complain about their nomadic lives, for fear of igniting Jim’s violent rage. When Jim accepts a position in 1960s Germany, the teenage siblings are surprised, then uneasy. Their parents have dark memories of the broken post-Nazi nation, and Tom and Melly can’t imagine what they could possibly do in a country where they don’t speak more than a few words of the language. As it turns out, there are lots of American teens on the secluded army base. Soon, Tom and Melly are exploring abandoned castles, swinging to the coolest dances at the Teen Club, and going to football games with their new friends. Romantic entanglements and school dramas make it easy to ignore the Cold War looming over their young lives. 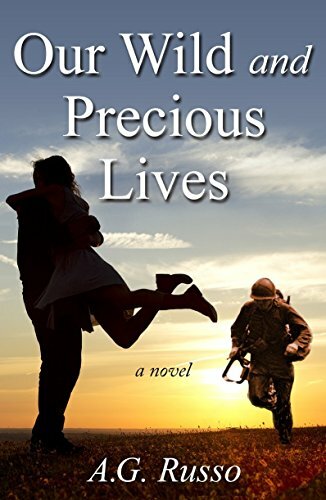 But every army brat has a secret, and as the McCarron teens get older, they realize that the cruelest wars are often fought on the home front. It’s rare to find a book that so vividly portrays the strong relationship between a brother and sister. In books for teen girls, the brother is often a hook to meet the cute love interest; in books for teen boys, sisters are usually minor characters. In Our Wild and Precious Lives, Tom and Melly’s love and devotion to each other was a touching storyline that reminded me of Jem and Scout’s bond in To Kill a Mockingbird. Having both young male and female perspectives gave the book an unexpected dimension, though Melly is the main focus. Melly McCarron was a spitfire! She had an enthusiasm for life that could not be contained, and as she grew older, she became a remarkable young woman. But her pro-feminist spirit and quick tongue could not save her from falling into a relationship that was, at best, complicated. Wes, her boyfriend, was certainly not my ideal man. Readers will have strong views on the outcome of her youthful affair. Brother Tom was less willful than Melly; his strength came through endurance and keen observations. In the dysfunctional McCarron family, he served as the reliable one. The few years he had on Melly were evident, since he made far less impulsive decisions and could see beyond a first impression. I was surprised and pleased that in Our Wild and Precious Lives, the parents get to share their story as well. Jim and Lina could have simply been unimportant, irritating parents, but their past is threaded though the story and makes the novel stronger. Jim’s PTSD and Lina’s OCD have heartbreaking causes that trace back to the Second Word War. It was curious to think of how one moment can trigger a chain of events that both create and destroys lives. The story spans several years in Tom and Melly’s high school careers, so many supporting characters pass through the pages. Each has an important story to tell, and even the most seemingly insignificant person can twist the plot at an unexpected moment, whether it be the Hawaiian librarian or the pompous jock. Some, like sweet Gwen and gentle giant LJ, became my favorite characters. History buffs will be thrilled with the many Cold War and 1960s references dropped in the book. Never fear: the information is not dull, nor does it feel like a duty textbook. There are many German words used, and the local color gives the novel an authentic flavor. Teens and adults can learn something new, whether it be a teen slang phrase or the architecture of an old European castle. It’s helpful to point out that Our Wild and Precious Lives doesn’t have a conventional plot. I’d be hard pressed to find an exact rising or falling action, and there could be several perspectives on which scene is the climax. It reminded me of a TV show – there’s a point to the story, but it flows with the characters’ lives, not a single mystery or issue. In this dramatic saga of love, family, and hope, the McCarron siblings learn to define themselves during the critical years of the Cold War.